Part of the thrill of meeting in Boulder is the ability to opt for off-site activities surrounded by nature. Just steps from the city, your group can enjoy Boulder’s open space and bond over some quality time on the trails. 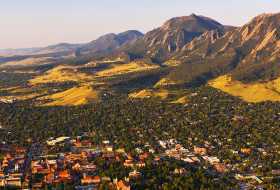 Take your group sightseeing on a jeep tour into the nearby mountains, go on a sunset safari in Boulder, plan a scavenger hunt, arrange a nature photography workshop — just about anything is possible thanks to this outdoor-loving town’s expert guides. We’ll point you to the right guides and outfitters for whatever you have in mind (and for any of the ideas below). Just ask! A network of 150 miles of hiking trails is available right in Boulder, with options for every level of hiker, including gentle nature walks and wheelchair accessible trails. You’ll see your group come alive as they take in the mountain views, spot wildflowers, breathe in the pine-scented air, and look for birds and animals. Ask us for trail recommendations, or for informative and fun naturalist-led group hikes, count on the city’s Open Space and Mountain Parks in Boulder. Three great and easy hikes for groups include Boulder Falls, the NCAR Weather Trail, and Enchanted Mesa. The winters are mild in Boulder, and hiking across the hushed, sometimes snow-dusted landscape is a rewarding fresh-air outing. You will likely only need hiking boots or snow cleats for traction, but snowshoes are available for rental, too. Find 5 great winter trails here. Treat your group to a ski day at Eldora, just a 35- to 40-minute scenic drive with no traffic. Choose from thrilling downhill skiing or cross-country skiing, and be sure to end the day with aprés ski drinks and bites at Eldora’s on-mountain bar and patio or back in Boulder at The Kitchen Upstairs, West End Tavern or Salt — or ask us for recommendations. From cruiser rides to mountain biking, groups can take advantage of the abundant and easily accessible paths, trails and terrain in Boulder. Learn how to downhill mountain bike, rent electric bikes to see the best of Boulder on a tight timeframe, ride to a farm dinner, or explore the scenery along the Boulder Creek Path, which runs right through the heart of town. Read more about bike tour options. Intimidated by the thought of taking your group rock climbing? Don’t be. Boulder’s expert guides will make it fun and approachable for anyone. It’s excellent for team building and doesn’t have to be extreme. Boulder is a rock-climbing mecca, with renowned climbing spots right in town and truly world-famous routes 20 minutes away in Eldorado Canyon. Enjoy the simple pleasures of a meal with a view. 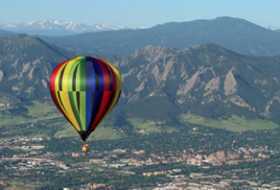 Book a city park shelter (Boulder has 1,800 acres of urban parkland) or spread a patchwork of quilts out on the lawn at Chautauqua Park for a picturesque and memorable meal, complete with Flatirons views. Here are 5 great picnic spots. Rocky Mountain runoff means a variety of clear mountain streams and rivers nearby. Explore them with a guided fishing trip, drop a hook in Boulder Creek, which rushes through Boulder Canyon and down through town, or go further afield for world-class fly fishing with a guide. Just ask and we’ll connect you with the best in town. With several stables nearby, your group can realize their dreams of living the cowboy/girl life here in Colorado. Enjoy equine entertainment along the trails, among the foothills and valleys that Boulder calls home. Boulder stables are listed here. If your attendees are looking to get in a run or walk before or after conference sessions, they’re in luck. The Boulder Creek Path is likely within minutes of their hotel door, offering more than five miles of shaded, paved paths along the creek, heading east toward the plains or west, eventually running between the striking rock walls of Boulder Canyon. Several state parks and one amazing national park (Rocky Mountain National Park) are within an hour of Boulder, making for a great morning or afternoon escape into the wilderness. Here are four wilderness escapes within an hour of Boulder. What is Boulder’s open space? 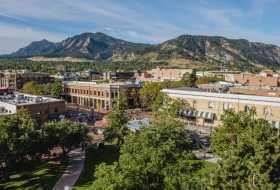 In 1967, Boulder became the first U.S. city to tax itself for the purpose of land preservation, ensuring the town’s magnificent setting at the foothills of the Rocky Mountains would endure for future generations. Today, the City of Boulder’s Open Space and Mountain Parks program manages 45,000 acres of protected land teeming with wildlife, native plants, and natural beauty. Contact us for free, personalized recommendations of outdoor activities your group will love.